Every year at the height of summer my village holds a street fair in which the main street is lined with stalls which groan under the weight of books, bric-a-brac and baking. Although everyone flits around the stalls looking for bargains and purchasing junk they’ll pay an exorbitant price for, but will never actually use, they all end up at the Scottish Women’s Rural Institute table. I’m going to let you into a little secret here, a secret which these women covet and rarely acknowledge to outsiders, but I know to be true. They have magical powers. Most of these women are elderly and hold life-long secrets to the best home baking. However, they also have the uncanny ability to produce the lightest, airy, pillowy soft, vanilla-scented perfect little rounds of scotch pancake using a portable camping stove on top of a rickety church hall table in the middle of Main Street on a hot summer’s day. 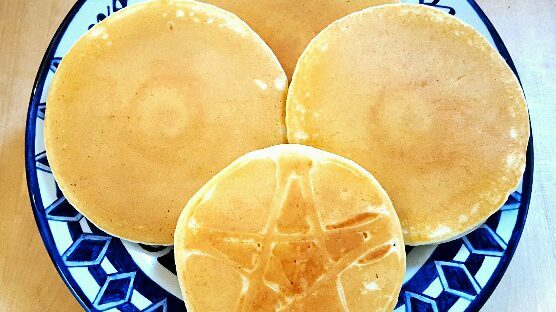 Aside from their coven’s unearthly good scotch pancake-making abilities, they also have the skill to enchant their stall to ensure that on this sunny day of festivity, no wasp, fly or honey bee will bother them. Nor will they bother the jars of homemade preserves the women concocted the previous autumn from the bounty of wild brambles which creep along the hedgerows and are brought along on street fair day to pour atop the little enchanted scotch pancakes they sell to their customers for a small fee. It’s possible my imagination has embellished the seemingly magical skills of these women. It’s not possible however, that I’ve in any way embellished the tastiness of their scotch pancakes. And just in case I’m right about the true supernatural nature of the women who are members of the Women’s Rural, you won’t catch me being disparaging about them within their earshot. I’d also guarantee that, judging from the wicked little twinkle in Mary Berry’s eye whenever I see her on TV, she’s bound to be a member of her own coven of baking witches. The sheer otherworldly tastiness of Mary Berry’s scotch pancakes also assures me that my suspicions regarding her otherworldly baking abilities are correct. Now, if you’ll excuse me, I’m late for a meeting with a group of women you really wouldn’t want to get on the wrong side of and I’ve still got some chores to do before I leave. After all, my broomstick’s not going to sweep the floor itself, is it? Put a griddle pan or a large frying pan on a low to medium heat and then add a very small amount of butter. Once the butter is melted pour a few tbsps. of batter onto the griddle , but try to pour it on one spot so you get a perfect circle of batter. If you’ve got a large enough griddle you can pour more pancakes to cook at the same time, but if not then just cook them one by one. Let your pancake cook for a while. When bubbles begin to appear on the top of the pancakes you can flip them over to cook the other side. 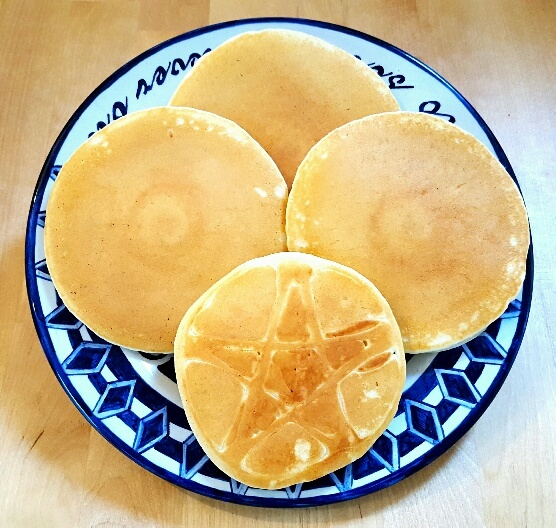 When your pancakes are light golden brown and springy to the touch they’re ready. 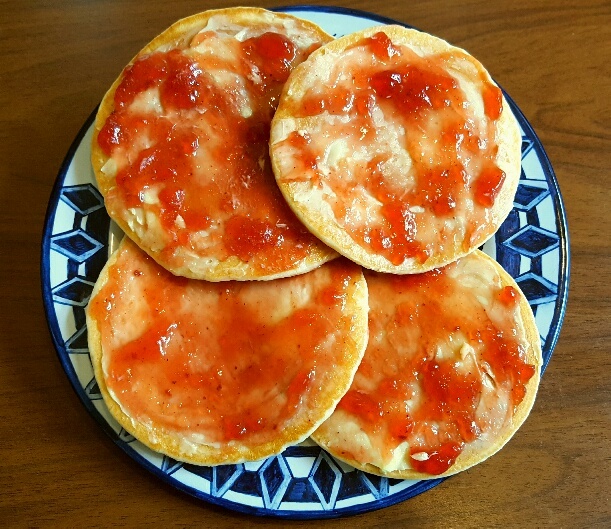 Spread with generous quantities of real butter and jam and enjoy while still slightly warm.